Update the Firmware................From time to time, Eclipse may release new versions of the firmware that controls the way that your marker operates, adding new features, improving existing features, fixing bugs or accommodating changes to major league rules that affect the way that markers operate. The E-Portal automatically downloads firmware from the Eclipse website as soon as it becomes available, keeping you up-to-date and future-proofing your marker. Modify the Start-up Screen...................Images can be created in the E-Portal, or any application that can create a 2-colour PNG or BMP file, and transferred to your marker in order to personalize the start-up screen. These images can be saved for future use and shared with friends and team-mates. Sample images are provided with the E-Portal software and new images, including the logos of Eclipse sponsored teams, are automatically downloaded as they become available. Manage the Control Parameters......................The E-Portal displays all of the marker control parameters (Settings) in one easy to read list. Parameters can be read from the marker, modified and saved for future use. User presets can be created for different firing mode configurations and these can also be saved for future use. 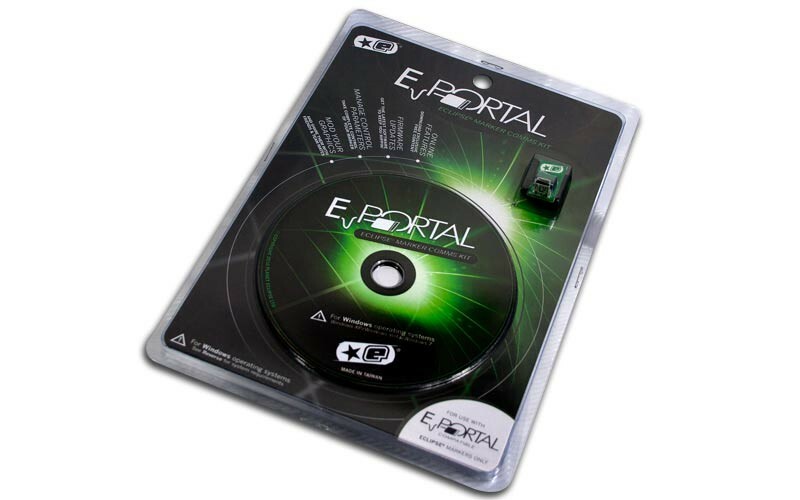 The E-Portal is compatible with Microsoft Windows XP, Microsoft Windows Vista and Microsoft Windows 7.